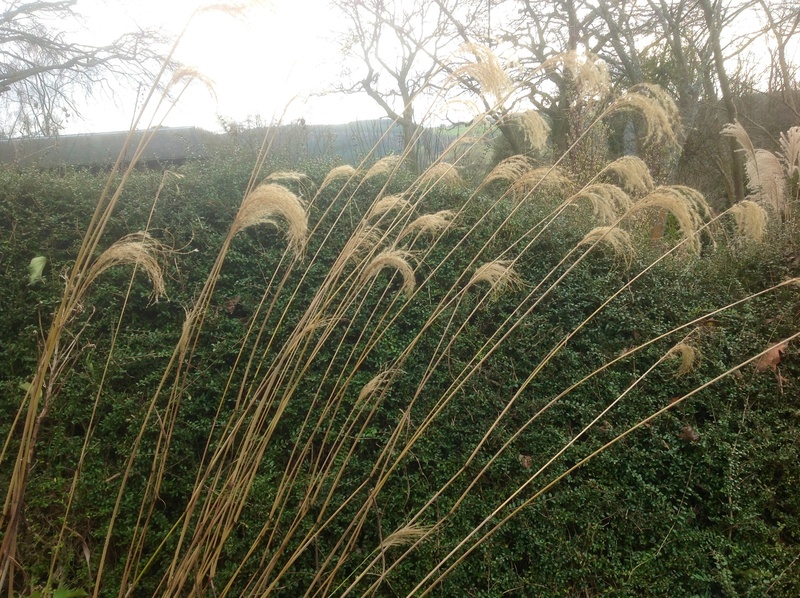 Though less often seen in garden centres Miscanthus nepalensis is a treasure to be sought after and cherished. Evocatively named, Himalayan Fairy Grass, this is a far from common ornamental grass and if treated with respect grows well in many UK gardens. Here in a neighbour’s well tended garden Miscanthus nepalensis looks regal in a 50 litre pot filled with free draining loam based compost. In fact, there are matching pair of them basking in the late afternoon sunlight. Clearly, the sunny sheltered terrace in their rose garden suits this grass, hence the breathtaking display. Erigeron karvinskiansus, with its charming pink-white daisy sets the grass off and gives the owners something pretty to look at while they wait for the grass to flower, here this happens in late summer. The sympathetic combination is also interesting, as potentially both might be seen off by prolonged wet winters and yet they have thrived left outside over winter for four years. Perhaps, life in a capacious pot suits them better than our South Gloucestershire heavy clay that is slow to warm in spring? Once upon a time, the plant lost in the melee above was an equally fine example. I should have known better than to move it from where it was happy in a sunny raised bed by the front door. In 2011 as I pored over the structural plan of the front garden, I could see that the beautiful bronze-gilt tassels would overhang the new path. My nepalensis has never been quite the same since. Every year it has been moved : first left to languish in a chilly spot in the orchard, then potted up to recover in the nursery, then potted on to hold its own in the display of summer patio pots and, now, is ground planted again. The biggest problem is the proximity of a neighbouring geranium (permanent resident) combined with the unwanted attentions of a persicaria seedling (whimsical addition to ‘fill space’ in early summer). At best the result is a pretty mixture, at worst this is a sad mistreatment of a good plant by someone who should know better. The question of hardiness often crops up with nepalensis, with some experts claiming that there is more than one form of this highly desirable plant, moreover, that some are hardier than others. I have bought good forms of this plant from both Knoll Gardens in Wimborne, and, Pan Global Plants, although regional plant hunter Nick Macer doesn’t currently list it in his online catalogue. Crug Farm Plants specialises in rare or unusual plants, the nursery is near Caernafon in North Wales. The RHS accepted named form “Shikola” is listed in the online catalogue sounds rather special for “its compact habit, purple-bronze tinted foliage combined with pink flushed inflorescences”. The owners Bleddyn and Sue Wynn-Jones collected it in West Bengal in 1994 and although slow to establish eventually it’s made a handsome clump. ‘Shikola’ is supplied as a 5 litre plant with the thrillingly vicarious addition of a collection number, BSWJ2302. The range of nepalensis in the wild is almost as romantic as the beautiful red then copper flushed drooping inflorescences that waft in the slightest breeze. As you’d expect it is found in Nepal and also across Western China, Bhutan, India, and Myanmar. This is true plant hunter’s territory. Alpine growers may be familiar with Chris Chadwell who runs expeditions to this region, connoisseurs subscribe to receive seed gathered by the expert himself (his seed bank used to include Miscanthus nepalensis). … whichever way I look at them. 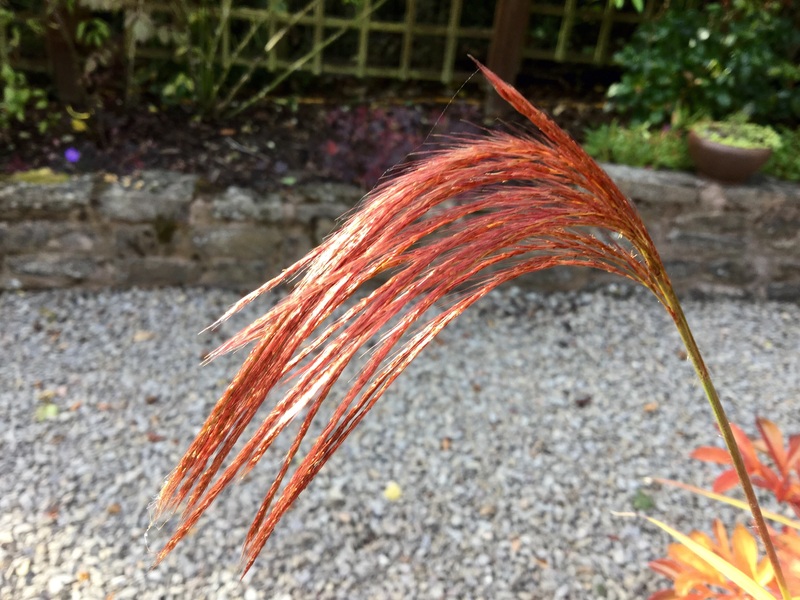 Of the many of species of miscanthus I grow (mostly quite well) it is rather ironic that nepalensis is the one that self-seeds most readily. Last year’s dried flower heads are still replete with ripened seed, although sowing freshest available seed from a good form in finest fettle is a good policy. The green fingered owner of the specimen next door sowed seed in shallow trays in late winter, patience and a propagation may be required as they take several weeks to germinate. Growth thereafter is slow, too, although moving them up into bigger pots sooner rather than later may help. Those potted up in mid summer from small modules to 1 litre pots have made the best progress. More conveniently, perhaps, the Royal Horticultural Society lists 27 suppliers, which is quite a lot for such a choice plant, including several in the Midlands and one as far north as Cally Gardens near Castle Douglass. I remain puzzled that nepalensis is described as a ‘tall’ plant at 1.2 metres in height, if not more, perhaps this really only applies to the height of it in flower? The long flowering stems are held like wands well above the foliage in a dramatic fashion. As temperatures drop emergent flowering spikes may stall and, like mine this year, fail to open unless conditions are optimum. (This is a trait I also see in Miscanthus sinensis cultivars.) Last year the same plant flowered more freely and looked good right up to March, the display will be scantier this winter. 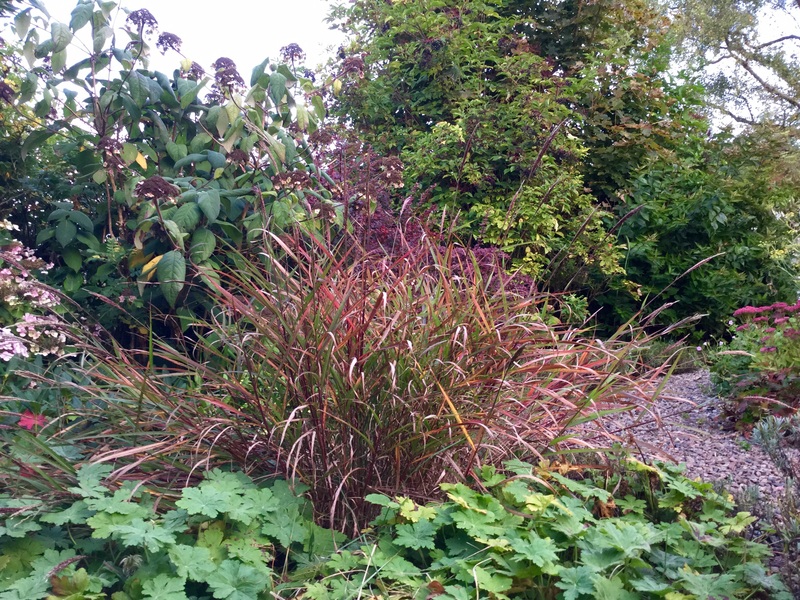 The mound of foliage seems to sit much lower for longer than might be expected compared with most other species of miscanthus, in my garden a cultivar of Miscanthus oligostachyus, above, would be another exception. At most I’ve seen my nepalensis make a loose mound of 3′, which was when it was happiest four years ago. Although its diminutive stature makes nepalensis a much friendlier plant for smaller spaces, lack of presence also means youngsters are easily swamped by plants that make rapid growth earlier in the year. And I really should know better. ‘Bad Dobby’, as my dear old dad would say. Yes they are quite different plants. Miscanthus sinensis ‘Morning Light’ is a favourite with me, I love it’s upright habit and light catching variegated foliage. I actually prefer it without flowers! Nepalensis is beautiful to me because of its gorgeous silken flowers. Dividing a mature M.sinensis requires a bit of heft, plus tea and cake. Good luck with it! 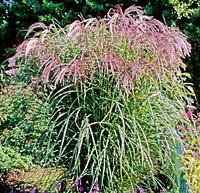 I grow a few Miscanthus but when I tried M. nepalense it only lasted one year unfortunately. We are on heavy clay, but the other Miscanthus seem happy. I’m sorry you lost yours, what a pity, maybe young ones really don’t like heavy clay and winter/spring wet. You’re right, they have different requirements to other species of miscanthus. I’m pleased the latter grow happily for you, they should be flowering nicely now. That copper flower plume is very attractive. I suggest kidnapping the neighbour’s pot while it looks so wonderful (kidding of course!). I managed to kill my only Miscanthus (sinensis). I planted it in the wild area, but it struggled for a few years, then didn’t come back. Probably too damp in the winter and too much competition of the summer. I do like the pot idea again though. Now there’s a thought! It’s a fine specimen, ‘museum worthy’ as we say. I can imagine cold wet feet would see a miscanthus off, especially a young one. ‘Moist but well drained soil’ is the refrain, tricky with heavy soils and prolonged winter/spring wet. Thanks to a mains leak, a 10’stretch of the fairly mature Miscanthus ‘Malepartus’ hedge here was flooded last winter and is looking a bit miserable, so I sympathise. Specimen one is stunning. 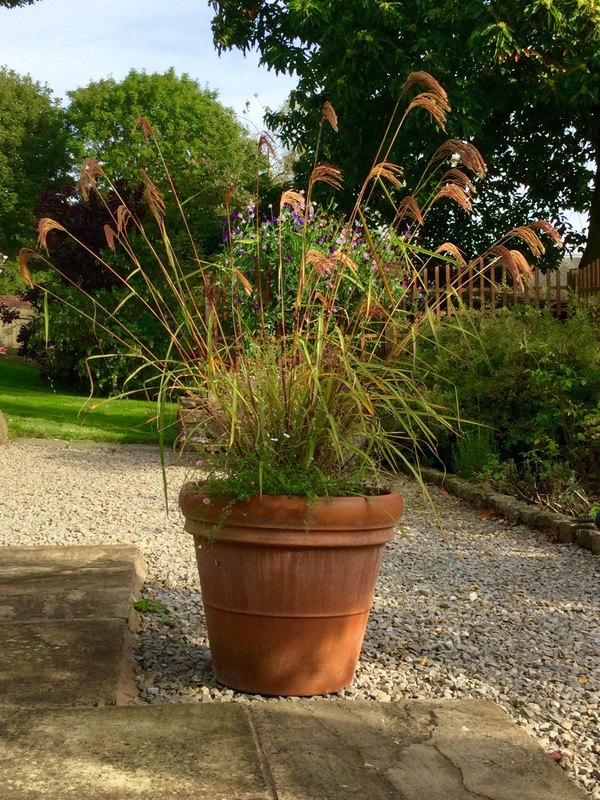 I am liking the idea of miscanthus in a large pot. Then I can move it into the limelight late summer. I’ve inherited a trolley from my parents to move large pots around so now I’m thinking pots are the way to go especially along a south-facing border where I keep losing stuff. I shall pass the compliment on to my neighbour. The sack trolley is a good garden accessory, siting huge pots permanently is even better. South and west walls are very lucky things to have too, although I have been caught out by not remembering that in a harsh winter plants in pots can feel 5C colder than when ground grown (; . Good luck with your pots, I agree, they are fun for ringing the changes. Good to hear from you Helen, also to know that it can be tricky from seed. Neil Lucas suggested other warm season grasses were best sown fresh, late summer-autumn depending on when they flowered …. Given that, it’s interesting that my neighbour has done so well with his from such a late winter sowing. The most difficulty I’ve had is with deliberate sowing of pink pampas grass, whatever I did it made no difference. No doubt if I’d scattered it Miss Wilmott style it would have worked (but in someone else’s garden). All the different grasses make a wonderful contribution to the late summer border especially during the lovely weather we have enjoyed lately. Yes, we’ve been very lucky with the weather, a bit different today though. 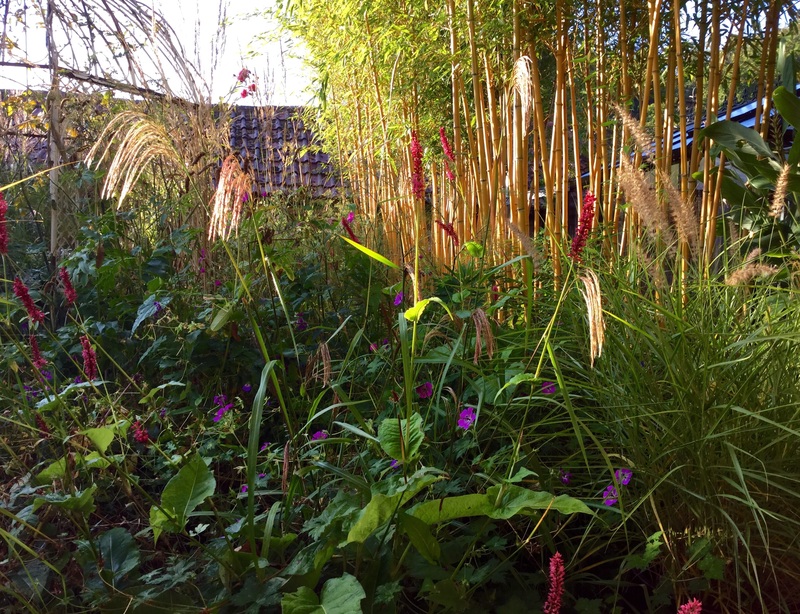 I rely on grasses to make an impact for most of the year, right now the warm season ones like miscanthus are enjoying their glory days, their plumes are so rich with colour. Thanks for stopping by, I’m enjoying your blog. Beautiful grasses Kate. Two clumps of my (previously tall) Miscanthus have only grown to about two feet tall this year. I’m not worrying. They will be better next year! Yes, ‘next year’ is what I always say too. Nothing is set in stone where plants are concerned.